This is an interesting area of discussion for us since these types of components can be used for power transmission and positioning. While many already know of the uses for gears and timing belts in power transmission, some may think that these components may be inaccurate for positioning purposes. With the various options nowadays of anti-backlash/precision-made gearing and timing belt/pulley systems, they can easily be employed for positioning purposes with high levels of precision. Shown in the above picture is a typical arrangement of an XL-sized timing belt/pulley system for gear reduction in both power transmission and positioning purposes. 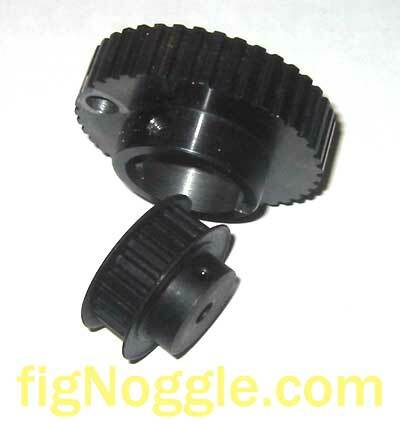 Timing pulleys come in variety of sizes or "pitch" which dictate the spacing between each "tooth". Within the various sizes, pulleys themselves can be found in various material compositions (such as all metal or metal/plastic), dimensions of the shaft fitment, outer diameter of the pulley as well as the width of the pulley since belts also come in different widths within each size specification. 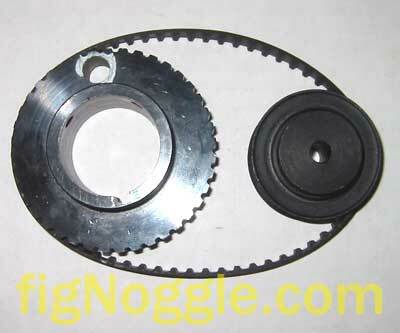 The picture below shows a picture of two all steel XL-size pulleys - one with a flange to prevent belts from slipping off the pulley and one without. Typically, larger pulleys will be flange-less. How the pulleys are secured to the shaft should also be taken into account. From a simple set screw arrangement for low torque to a clamping or keyway arrangement for higher torque, these are all options you will be faced with when selecting the appropriate hardware for your machine. Here is an example of a batch of various length pulleys of XL-spec. In the label on top, you can see the identifier "110XL025G". This means that there are 110 teeth of spec XL and the belt width is 0.25". 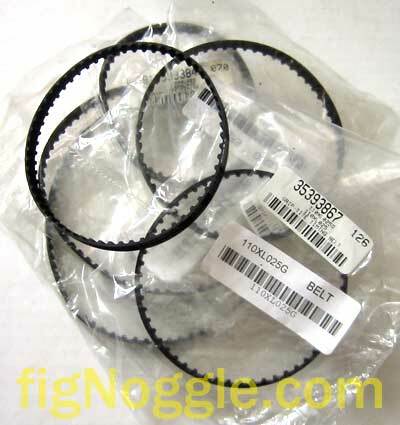 These XL025 belts are great for the little and mini-machines. One of the best places to source components such as this is SDP-SI (Standard Drive Products / Sterling Instrument).